Together with Sartorius, a new, patented test method was developed on the basis of preliminary tests. This is a new helium leakage test method in which the limiting leak rates are defined with a 2μm diameter. 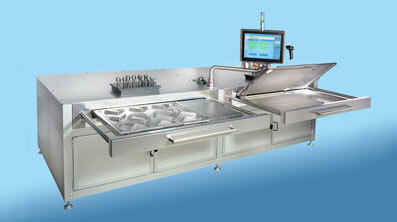 The tester is designed for clean room requirements and there are high demands on cleanliness. Consequently, the test gas must be filtered and the piping must be clean up to the test part. => Stainless steel piping, FDA-approved valves and seals, stainless steel for product-contacting parts and dry-running vacuum pumps. Wide product range with bags from 50ml to 50l, with and without different connecting hoses, with connectors, tees, hose clamps, filters. Various connection variants in the form of various connectors and sterile connectors, as well as open hoses with different diameters. This means that different quick-change sealing tools are necessary. Either individual large biocontainers or up to 4 small biocontainers can be tested at the same time. The test chambers are designed so universally that, with the exception of the change of sealing tools, no setup procedures are necessary. The universal test chambers allow new product variants. Optional there are such systems for 3D Bags up to 500l. Depending on the requirement, for example, the hole size, the appropriate test method is specified.